The borders of our pictures automatically provide viewers with two dimensions – height and width. Creating a 3-dimensional world on a flat computer monitor or a photographic print is a bigger challenge for the beginning photographer. But it is a critical skill that photographers master to add realism and draw viewers into their pictures. To add the sense of depth to pictures, we’ll first consider how our eye/brain combination senses three dimensions in the real world. By applying these visual cues to our photography, we can instill the illusion of three dimensions in our pictures. This series of blog entries will present several methods of introducing the 3rd dimension into our photographs. One of the most important cues our eye/brain seeks out, in its search for an understanding of any scene, concerns focus. In photography we call the phenomenon “depth of field.” Our brain understands that when there are multiple objects in a scene, and they are all equally sharp, then they are probably located on or very close to the same plane. Above is a simple flower picture. 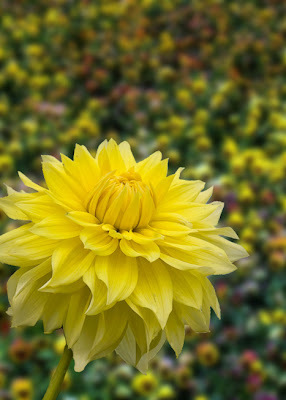 The main subject is obviously the large yellow dahlia. Notice that all the smaller flowers (pansies) surrounding the dahlia also appear sharp. To our mind, logic dictates that all of these flowers must be very close together (from front to back). Because everything is in focus at the same time, there is no obvious visual cue for our mind to place any degree of the third dimension to this picture. As a result, it looks flat and two-dimensional. Contrast the first picture with this version of the same scene below. In this image the dahlia remains sharp, but the pansies are soft and out of focus. Our eye/brain thinks, “Ah, there MUST be distance (or depth) in this picture because there is a visual difference in the sharpness of the elements that make up the image.” We immediately attribute this difference in focus to be the result of their spatial locations in the real world, and we mentally experience the third dimension of depth. We create this 3D illusion when we take the picture. We visualize the final print BEFORE pressing the shutter release button. And, when using a camera with aperture controls, we intentionally select an f/stop that will render this "selective focus" effect. Large aperture openings (smaller f/stop numbers) create increasingly shallower depth of field (more and more of the scene in front of and behind our focused subject is out of focus or blurred) and infuse that important sensation of three dimensions into our photographs. Shown below are a series of photographs taken of the same subject to illustrate the impact of aperture size to the amount of the total image that is in focus. The camera's focus point in these pictures was the foreground bottle. 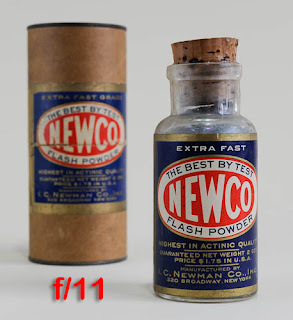 Notice that as the f/stop number increases (and the aperture opening size decreases), the bottle in the background becomes increasingly sharper. Also notice how depth is emphasized by the out-of-focus background image, AND how your eye is drawn FIRST, like a magnet, to the sharpest object in each picture. By learning to control depth of field, we – as photographers – infuse the third dimension into our imagery. Since our eyes are automatically drawn FIRST to objects that are in focus, we are also intentionally directing our viewers' eyes to the subject of our photograph. I hear you asking, “Then what about landscape photographs were everything is in focus from foreground to background. How do I inject three dimensions into this 'totally in focus' picture?" That will be our next tip for creating the illusion of 3 dimensions. 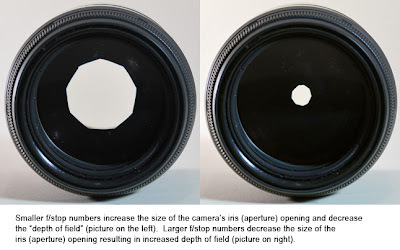 nice explanation on the aperture..